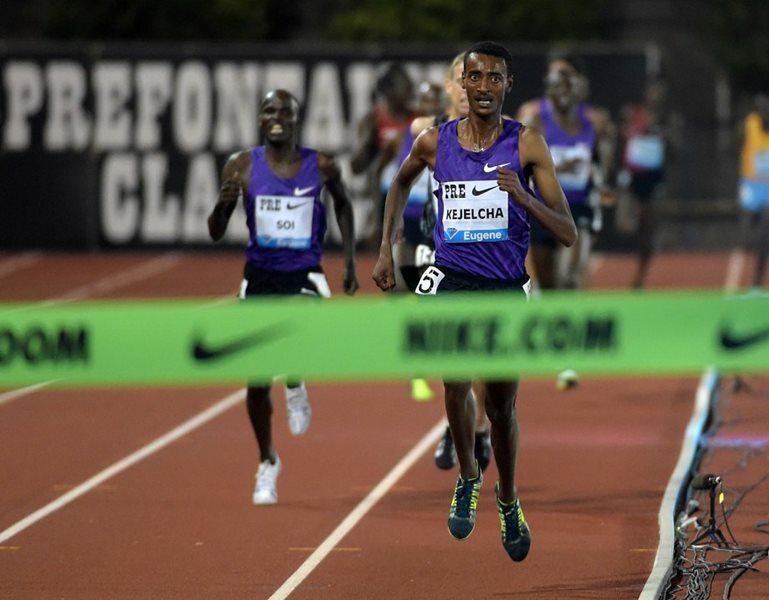 ATHLETICS NEWS - Ethiopia's Yomif Kejelcha, twice a world indoor 3,000m champion, missed the world indoor mile record by one-hundredth of a second on Saturday in a dominating victory at the Millrose Games. The 21-year-old distance star captured the feature event in the 112th edition of the US indoor classic in 3mins 48.46secs, with Kenya's Edward Cheserek a distant second in 3:53.29. But Kejelcha fell agonizingly short of his target, the mile indoor world record of 3:48.45 set by Morocco's Hicham El Guerrouj on February 12, 1997 at the Flanders indoor meet in Ghent, Belgium. Kejelcha was not the only African runner to settle for the second-fastest time in history at the meet. Kenya's Michael Saruni ran the second-fastest indoor 800 meters in history, winning in 1:43.98. Saruni's effort was second only to the indoor world-record time of 1:42.67 set by Denmark's Wilson Kipketer in Paris at the 1997 World Indoor Championships. "Oh man, it's crazy," Saruni said. "I trained hard for this moment. I just had to do it." Donavan Brazier was second in an American record 1:44.41 with American Sam Ellison third in a personal best 1:46.13. "I'm excited about that, but Saruni snuck up on me," Brazier said. "I had the other record but he passed me." Brazier erased one of the oldest US indoor marks, lowering the former record of 1:45.00 set by Johnny Gray on March 8, 1992 at Sindelfingen, Germany. A hush fell over the meet when Jamaican Kemoy Campbell, serving as a pace-setter to move the men's 3,000 field along quickly, collapsed and fell into the infield just after the second turn just beyond the 1,000m mark. Campbell, 28, was carried out of the facility on a stretcher as other events were halted while he received medical attention. The Jamaica Gleaner reported Campbell was in stable condition while Sports Illustrated reported Campbell was breathing with assistance and will remain hospitalized overnight in an intensive care unit. American Grant Fisher won the men's 3,000 in 7:42.62 with Australian Morgan McDonald .14 of a second back and Kenya's Amon Kemboi third in 7:44.77 -- all with personal bests. In the shot put, where final heaves were delayed while Campbell was treated, reigning Olympic champion Ryan Crouser won with a personal best and 2019 world best 22.33m while US compatriot Joe Kovacs, the Rio Olympic runner-up and 2015 world champion, was second on 20.63. Konstanze Klosterhalfen won the women's mile in a German record and season world best 4:19.98 with American Colleen Quigley second in 4:22.86. "It's very amazing. Everything is so exciting," Klosterhalfen said. "I'm just very happy to be here and run this time. It was really fun." Two-time world indoor runner-up Ajee Wilson set an American indoor 800m record, winning in 1:58.60, shaving .11 off the old US mark set by Nicole Teter in New York in 2002 - and that was after being knocked off stride twice by contact with rivals. "I'm very excited," Wilson said. "I wanted to get it done today. Super happy that I was able to get it done. I got clipped a few times but had to remind myself to stay in it, stay focused and go for the win." Natoya Goule finished second in a Jamaican record 1:59.13. American Vashti Cunningham, the 2016 world indoor high jump champion, defended her Millrose crown by clearing 1.95m.